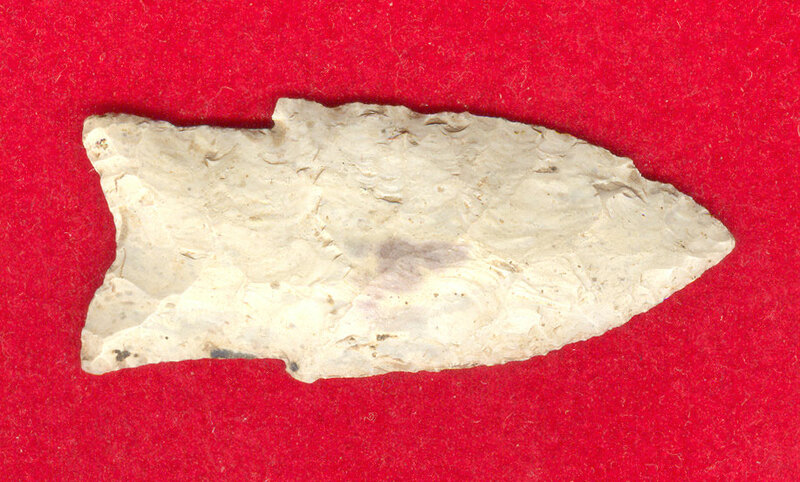 A Medium Size, Thin For The Size, Visibly Aged, Nicely And Well Made Made, Holland Point That Exhibits Surface Sheen Aging And Stone Coloration Patination, Overall Aged Surface Deposits, Correct Blade Sharpening Use Reduction, Aging At The Stem Notches, River Polished Surface Wear, Correct Concave Base And Weak Shoulders, Correct Material And Manufacture For The Area Found. Found On The Arkansas River In Tulsa County, Oklahoma. Ex-Rodney Blount Collection. The Holland Points Are Somewhat Similar To The Repeatedly Sharpened Hardin Points Not Commonly Found In Oklahoma. Includes A Ken Partain Certificate Of Authenticity.